Currently I'm enrolled in a bio-process design class and our assignment for the semester was to come up with a product and explain the process design of it. Since I'm crazy about hair, I asked my friend if she wanted to design a yogurt-based hair conditioner and she agreed. It's fairly easy to make it. All you need is yogurt, jojoba oil, and rosemary oil. The reason we chose jojoba oil is because it adds shine, softness, reduces frizzyness, and promotes thick lustrous hair. We also chose to add rosemary oil helps stimulate blood circulation in the scalp that helps promote healthy hair growth. Not only is the rosemary good for your hair, it is a great scent and is also a therapeutic agent. 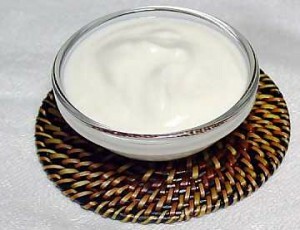 Yogurt is a great ingredient for a conditioner because it is natural. Also it helps restore softness to dry brittle hair and it is full of protein, which helps keep hair strong and full of elasticity. After mixing up the conditioner, apply large amounts of it to your hair and let it sit for 10 minutes and then rinse. Since the conditioner is yogurt, store it in the refrigerator and make sure to throw it away after three weeks because it will spoil.